The Mongoose Jetters Model 184 is this brand’s best selling sewer jetter unit, with reliable features such as the Mongoose Run Dry Pump at 18 GPM @ 4000 PSI, tubular steel frame, corrosion resistant pre-painted sub assemblies, state of the art controls, strong hose reel and high quality gas engine. This machine will return more on your investment than anything in its class. The Model 184 is excellent for drain cleaning and sewer jetting, main lines up to 12″ diameter, remote access locations, commercial and industrial lines and more. The Model 184 Trailer unit comes with a tank capacity of 300 gallons, standard hose reel capacity is 600 feet of 1/2″ hose and a minimum 70 hp gas engine (diesel engine is optional, or California Emissions available). The trailer setup consists of a 6,000# rated single axle trailer, and the addition of a wireless remote control system makes this equipment a true one-man operation. The Model 184 is also available as a Van Pack unit. To see more options for your Mongoose Jetter, check out our available Custom Options. The Model 184XL Sewer Jetter Trailer comes with a tank capacity of 600 gallons, standard hose reel capacity is 600 feet of 1/2″ hose and a minimum 70 hp gas engine (diesel engine is optional, or California Emissions available). The trailer setup is a dual axle trailer rated for 9,900#, and the addition of a wireless remote control system makes this equipment a true one-man operation. To see more options for your Mongoose Jetter, check out our available Custom Options. The Mongoose Jetters Model 184 is this brand’s best selling sewer jetter unit, with reliable features such as the Mongoose Run Dry Pump at 18 GPM @ 4000 PSI, tubular steel frame, corrosion resistant pre-painted sub assemblies, state of the art controls, strong hose reel and high quality gas engine. This machine will return more on your investment than anything in its class. The Model 184 is excellent for drain cleaning, main lines up to 12″ diameter, remote access locations, commercial and industrial lines and more. The standard Model 184 Truck (184-TK) unit comes with a tank capacity of 300 to 600 gallons, standard hose reel capacity is 600 feet of 1/2″ hose and a minimum 70 hp gas engine (diesel engine is optional, or California Emissions available). This truck mounted unit allows for many chassis options depending on your specific preference, and the addition of a wireless remote control system makes this equipment a true one-man operation. To see more options for your Mongoose Jetter, check out our available Custom Options. The Mongoose Jetters Model 184 is this brand’s best selling unit, with reliable features such as the Mongoose Run Dry Pump at 18 GPM @ 4000 PSI, tubular steel frame, corrosion resistant pre-painted sub assemblies, state of the art controls, strong hose reel and high quality gas engine. This machine will return more on your investment than anything in its class. The Model 184 Sewer Jetter Truck is excellent for drain cleaning, main lines up to 12″ diameter, remote access locations, commercial and industrial lines and more. The Model 184 Enclosed Truck (184-ETK) unit comes with a tank capacity of 300 to 600 gallons, standard hose reel capacity is 600 feet of 1/2″ hose and a minimum 70 hp gas engine (diesel engine is optional, or California Emissions available). All components in this model are mounted inside an enclosed truck for maximum protection of your equipment. 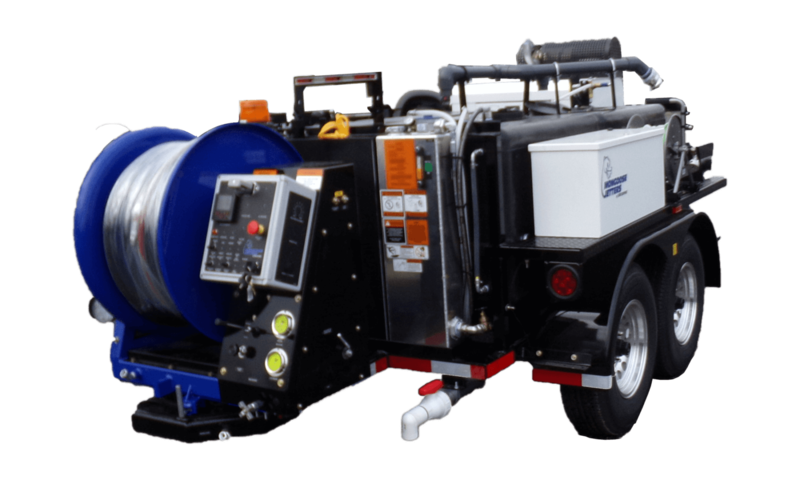 This sewer jetter truck mounted unit allows for many chassis options depending on your specific requirements, and the addition of a wireless remote control system makes this equipment a true one-man operation. To see more options for your Mongoose Jetter truck, check out our available Custom Options. Mongoose Jetters Model 184 is this brand’s best selling unit, with reliable features such as the Mongoose Run Dry Pump at 18 GPM @ 4000 PSI, tubular steel frame, corrosion resistant pre-painted sub assemblies, state of the art controls, strong hose reel and high quality gas engine. This machine will return more on your investment than anything in its class. The Model 184 is excellent for drain cleaning, main lines up to 12″ diameter, remote access locations, commercial and industrial lines and more. All Mongoose Jetters can be ordered with an additional hot water boiler with a rated 400,000 BTU output to enhance jetting capabilities. In certain applications, warm or hot water can increase the cleaning effectiveness of high pressure jetting in cold weather operations, especially when cleaning grease from pipes or clearing ice-clogged pipes. The hot water boiler can be added to all units, both open and enclosed trucks and trailers. To see photos of boiler options, check out Custom Options.